who have participated with us! Cinquegranelli Montessori has been serving children and families in the Sunset Hill/Ballard area since 1989. Our school offers a child-centered, learning environment for children three to six years old. It is a half-day program that runs Tuesday through Friday. Montessori philosophy and Italian language are the key emphases of our program. At Cinquegranelli we strive to create an environment where children learn at their own pace, guided by their intrinsic developmental needs. It is our responsibility to recognize such needs and to guide them to works that satisfy their hunger for learning. It is our intention that each child become competent, confident, creative, and respectful human beings. 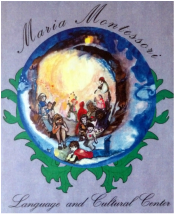 The Maria Montessori Language and Cultural Center (MMLCC) is our 501c3 non-profit organization established in 1999 by Gail Longo, parents, and friends of Cinquegranelli Montessori School. The MMLCC is working to bring awareness into our community by exploring interpersonal relationships and the effect of emotions on mind/body development and mental health. See below for information on our upcoming workshop! SUPPORT OUR NONPROFIT, MMLCC, WHEN YOU MAKE PURCHASES THROUGH AMAZON SMILE!